Hotel Palwa can ensure your delightful stay in one of the 38 fully enhanced rooms with a 24/7 room service and security. Whether your stay may be for business or pleasure, may it be for a few days or months, Hotel Palwa is surely a convenient place to stay. The rooms at Hotel Palwa are indeed cozy, elegant and convenient with spacious and clean surroundings. The staff at Hotel Palwa are fully committed and friendly in giving you the best hotel experience here in Dumaguete City. You may choose from the four different types of rooms to stay for a few days or get the monthly rates to enjoy Dumaguete City a little more. 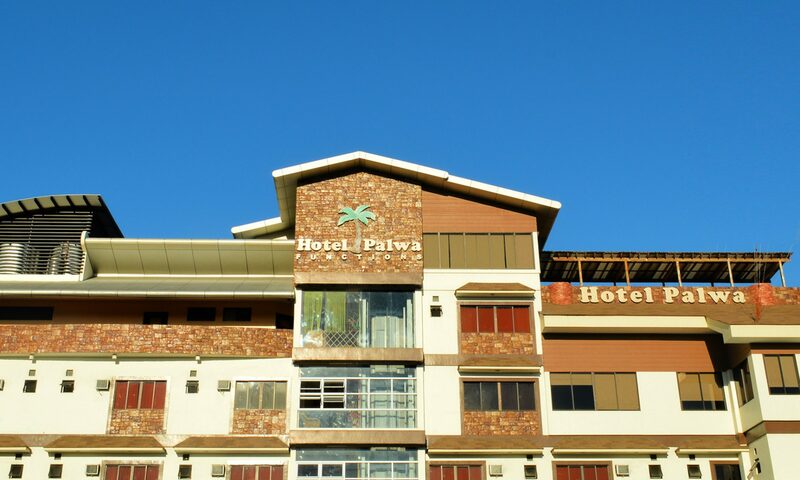 With a total of 38 convenient rooms, Hotel Palwa can accommodate a total of roughly 90 guests. The hotel offers a conference room as well with a stunning view that could fit 30 people and a gorgeous function hall with fully functional line sound system that could fit up to 230 people during events like birthdays, weddings, reunion and others. Hotel Palwa meets the standards of our guests coming from all parts of the world. With modernized and easy access equipment, we offer a new meaning of convenience here in the heart Dumaguete City. The hotel staff speaks fluently both local language and English.Any further inquiries or questions can be answered by front desk 24/7. With so much to offer and little time to waste, the rooms at Hotel Palwa offers an affordable and worthwhile stay here in Dumaguete City. Getting to Hotel Palwa is super easy! The hotel offers free pick-up services from the Dumaguete Airport in Sibulan or from the Dumaguete Seaport at the Rizal Boulevard. If by any chance that one decides to roam around first before reaching the hotel, it is still easy to find the hotel via local rides called ‘trike’ or tricycles. Local drivers will take you to the well-known ‘Hotel Palwa’ located along the Dr. V. Locsin Street, corner Real Street. Explore the beauty that sets Dumaguete City apart from the rest. With breathtaking views, delicious and savory food, accessible transportation and most of all friendly people, Dumaguete City is just a must-see place to visit. With Hotel Palwa at your full service, have a super comfy and elegant accommodation as you see Dumaguete City in the most convenient way. Dumaguete City, known as the “City of Gentle People”, is main door to visit the amazing attractions from all over Negros Oriental and Negros Island itself. A whole lot of relaxing yet still adventurous journey awaits you in your stay here in Dumaguete City.